Want to tame the Old West or make it even more rowdy? Ready to stride manfully down Main Street at High Noon? Or just happy to get involved in some rootin’ tootin’ shootin’? Then why not join us for our latest gaming experience here at our HQ! Tickets will cost £30 and will cover all food and drink, including snacks and a hot lunch. Players should bring along their rulebooks, dice and tokens for use on the day and their own 28mm miniatures taken from a suitable range. 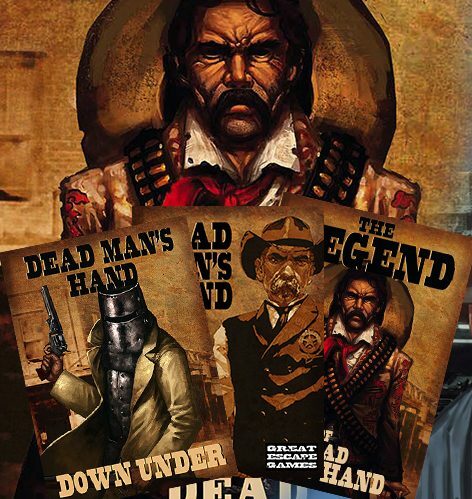 Gang creation rules will apply from the official rulebooks, Dead Man’s Hand, Legends of Dead Man’s Hand or Dead Man’s Hand Down Under. So, load your six shooters, grab your stetson and sign up here today. Follow the link for a full event breakdown.